Srinagar: The Jaish-e-Mohammad (JeM) has intensified its focus on Kashmir in the wake of the 26 February Indian Air Force (IAF) strike on its terrorist camps in Pakistan, intel inputs to security agencies suggest. Senior Jammu & Kashmir police officials said the Pakistan-based terrorist group has been under a two-pronged attack from India ever since a suicide bomber affiliated with the JeM killed 40 CRPF personnel on a Jammu-Kashmir highway on 14 February: Apart from the strike on its camps in Khyber-Pakhtunkhwa, more than a dozen militants affiliated with the outfit have been killed in multiple encounters across Kashmir. According to the officials, there has been a spike in intelligence inputs pertaining to Jaish activity since the air strike. Even as they said the authorities concerned had taken “necessary precautions”, the officials claimed that the “credibility” of the intel was being established to rule out “diversionary tactics” or possible attempts to mislead the authorities. “There has been a spike in human intelligence pertaining to Jaish, but that is understandable given that security forces have prioritised targeting the militant outfit,” a senior Srinagar-based police official said, requesting anonymity. “Nevertheless, we are not taking any chances and taking all necessary steps to ensure peace in the region,” the official added. ThePrint has accessed multiple intel notes received by security agencies from 8 March onwards, one of which suggests the Jaish is aiming to make its presence felt in Kashmir, including J&K summer capital Srinagar, by “effecting” crude bomb blasts. The group, according to a 9 March input, is looking to use crude bombs similar to the ones used by the JeM on 25 January, a day before Republic Day, when “12 blasts occurred [in Kashmir] over a period of three hours”. “These crude bombs, which are low-impact devices, will be used at multiple places, including Srinagar, simultaneously, and may be alternated with conventional hand grenades to cause actual casualties,” the input reads. “Pertinent to mention that JeM effected a similar pattern of activity on 25th January evening just before Republic Day, when at least 12 blasts occurred over a period of three hours, many of them in Srinagar,” reads the input. Another input received the same day claimed that two groups of four Jaish militants each were attempting to infiltrate India through the Poonch and Kathua sectors to carry out attacks in Jammu and Udhampur. Other inputs talk about Jaish activity on home turf Pakistan. An intelligence input received by security agencies on 19 March talks about a Jaish “launching commander attending sniper training organised by Pakistan army somewhere in Shakargarh area of Narowal district”. “JeM cadres have been called for special training called ‘bada sabak [big lesson]’,” reads the input. “Pak army also giving access of forward posts to terrorist commanders/fresh cadres to carry out border action team/snipping actions under cover of ceasefire violations,” the input adds. 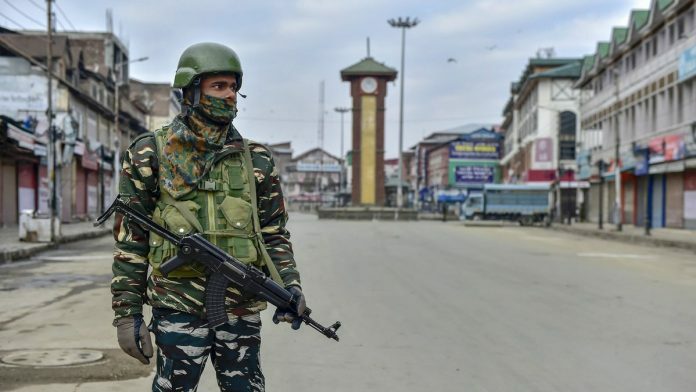 Another senior police officer involved in counter-insurgency operations sought to make a distinction between inputs pertaining to Kashmir and those about Jaish operations “outside Kashmir”. While the “increased Jaish activity” in Kashmir is being “taken care of”, the officer said, the spike in Jaish activity across the border “is always a concern”. “There were around 55-60 active Jaish militants [in Kashmir] before the Pulwama attack and, as we know, nearly a dozen of them were killed in encounters in the last two months,” the officer added. “This includes top commanders and planners of the [Pulwama] suicide bombing. Other than these gun battles, Jaish hasn’t been able to attack our forces. This could be a result of our operation as well as the international pressure on the outfit [since the Pulwama attack],” the officer added. “The government of India entered Pakistan airspace to target Jaish camps and, in response, Pakistan claimed to have crossed the Line of Control [LoC],” the officer said, referring to the 27 February LoC breach by the Pakistan Air Force [PAF] that triggered a bilateral dogfight. It is in this context that the agencies are studying an input from 8 March that claimed JeM chief Masood Azhar had met Taliban and Haqqani Network commanders mid-December. Meanwhile, the involvement of local Kashmiris in Pakistan-backed terrorism has local players worried, especially as the state prepares for the 2019 Lok Sabha elections, followed by assembly polls at an unspecified date. The worry is amplified in south Kashmir, considered a hotbed of homegrown insurgency. The 14 February attack, for example, was carried out by a 20-year-old Kashmiri youth from Pulwama, south Kashmir, who is believed to have joined the JeM while in Class 11. Talking to ThePrint, Peoples Democratic Party (PDP) leader Waheed Para said the government’s crackdown on separatists had led terrorists to occupy their space, allowing them to dictate terms and also recruit at will. “A tremendous political vacuum has been created in Kashmir, particularly in the south,” Para added.